Christine's Joie de Vivre: Happy New Year! 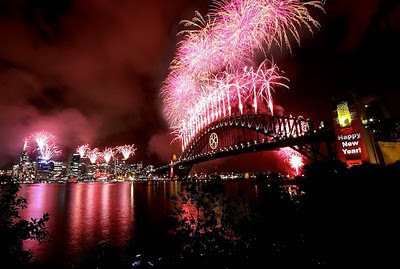 Sydney is my second favorite city in the world, next to Washington DC, where I spent Christmas with family. What's in Australia other than burping blokes and surfing dudes and dudettes? More relatives, the nicest people and an incredible culture. I've had the opportunity to visit Sydney and the last time was 10 years ago for the millenium. It was my dream and goal. Then I remembered, I have reached every goal I set. I am truly blessed to be born in the USA where in America you can do anything! Life is a journey but also an adventure! Here's wishing a brighter New Year for all people around the world. Never stop dreaming, never stop striving, never stop believing, and TIME will shine the light on the passage for a brighter future!